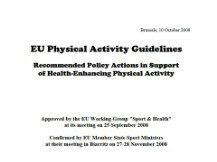 The EU Working Group "Sport & Health", which is open to participation by all Member States, received a mandate from Member State Sport Ministers meeting under Finnish Presidency in November 2006 to prepare EU-level Physical Activity Guidelines. The most central concern was to have guidelines suggesting priorities for policies that would promote increased physical activity. For this purpose, the Working Group appointed an Expert Group of 22 well-known experts with the specific purpose of preparing such guidelines. These Guidelines are addressed primarily to policy makers in the Member States, as inspiration for the formulation and adoption of action-oriented national Physical Activity Guidelines. The purpose of the document is not a comprehensive academic review of the subject, nor a redefinition of WHO recommendations and targets. EU added value is provided by focusing on the implementation of existing WHO recommendations for physical activity, by being action-oriented and by being solely focused on physical activity (and not nutrition or other related topics). This document is intended for a wide range of users who deal with physical activity. 7. Public Awareness and dissemination.